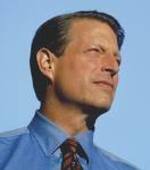 The Faculty Lounge: Gore For President. And No, I Am Not Joking. "Hillary's successful efforts in Pennsylvania and Ohio suggest that Obama may have real trouble with these important states." Please explain why you think this to be the case. This is a line the Clinton camp has been spinning for months, and not a single person has been able to explain why Obama's showing in a Democratic primary in a particular state has any relation to his likelihood of success in that state in a general election. John, neither Ohio nor PA are shoo-ins for a Democrat. When it appears that one candidate - in this case, Obama - is having trouble courting a particular Democratic cohort in those states, when that group sizably backs the other candidate, when that group has shown a willingness to vote Republican in the past, and when exit polls suggest that many of these folks will indeed back McCain, I think there's something to worry about.